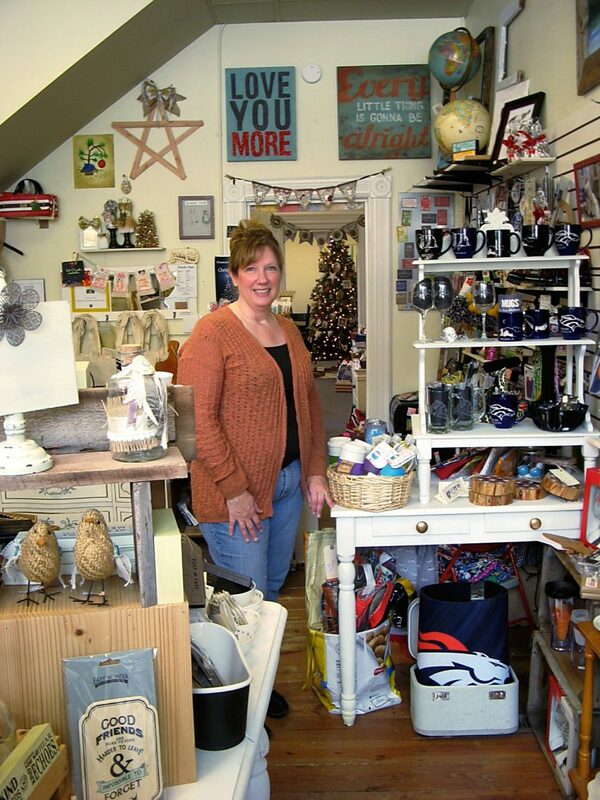 Co-owner Denise Groves with local handicrafts at Speckled Feather Mercantile in New Castle. Early in the new millennium, the town manager of Carbondale made a dire forecast: the town was going broke, and in the next year or two, deficits would run into the hundreds of thousands. I have it in my notes. At the time, Carbondale was torn asunder over the prospect of a big box development at the edge of town. I was working as a radio reporter and attending town meetings where 100 or more citizens would regularly show up. Room dividers had to be rolled back at town hall to accommodate the restive crowds. Some folks said they didn’t like driving all the way to Glenwood Springs to shop. Others countered that they moved to Carbondale for the community and outdoor life, not to shop. The town manager said economic disaster was assured if a big box weren’t built. He was out of step, as a ballot question would subsequently prove. And it turned out he was wrong. In the years that followed, tax revenues shot up and up. But it didn’t happen as if by magic. While the debate raged, certain community members worked to raise consciousness about the benefits of economic localization. Speakers came to town. Books on the subject were ordered and distributed. A campaign to encourage shopping in Carbondale was launched. During its next fund drive, KDNK gave away boxer shorts and tie-dye socks as membership premiums. There was some attempt to create a local currency — “money” that could only be spent at participating local businesses. KDNK’s Community Card is a vestige of that idea. People talked about carrying capacity. What population could the valley really sustain? How much of what we consume might we produce? How did the pioneers subsist 100 years ago, and what did Carbondale produce then, anyhow? Potatoes and coal? The answers remain elusive, but in the meantime, armed with new awareness, folks began to explore the small shops, to favor local businesses over chains, even to spend a little more or buy a different item in order to buy local. A couple summers ago, I swayed to the rhythm as a live band played on Main Street. I looked around at the thriving businesses surrounding me and could only admire what the community had accomplished. Go there on a First Friday and see the packed restaurants, the groups of friends crowding the sidewalks, the young people drumming on a corner. Main Street has blossomed. We’ve seen the statistics. Studies show big boxes and chain stores kill local businesses and siphon money out of town. A decade later, Carbondale stands as a model of the inverse — what happens when a community rallies around its local entrepreneurs. Buying food from local restaurants and farmers, or merchandise from cottage industries and independent stores, or services from friends and neighbors in the trades makes a bigger economic impact. How big? Studies suggest it’s about three times as big. It’s called a multiplier, and in case you haven’t studied economics, this is how it works. When I spend five dollars, it gets spent and re-spent in a way that can be calculated. If it ends up in the investment portfolio of a corporate CEO, it won’t go as far as it would if it gets passed among working and middle class folks who spend most of the money they see on goods and services. If they, too, spend locally, the impact grows. Last weekend I sold Colby Farms honey at Sunshine Farm’s Christmas Bazaar. Several other vendors said they’re busy this month selling their handmade goods at area holiday craft sales. In downtown New Castle, Speckled Feather Mercantile is jammed to the rafters with locally crafted art, household items, food and more. Going local creates more local wealth and jobs. Go big with the money you’ve budgeted for Christmas presents and holiday entertainment this year by spending in your own community. It’s the gift that keeps on giving.